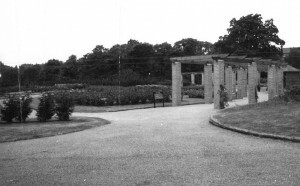 The rose gardens in the northern part of the Arboretum were constructed in 1972. 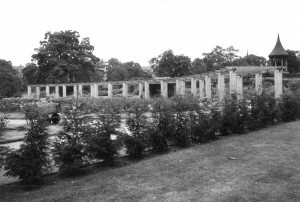 They replaced the green houses that were in situ for a significant part of the history of the park and demolished in 1970. 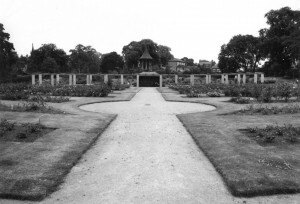 The structure and the rose bushes have now been removed (2011) and the area subject to new planting and development. The rose garden was a popular place for wedding photographs to be taken as the Nottingham Registry office was only a short walk away on Shakespeare Street, in a building which was originally the Nottingham Poor Law Offices. In 2012 the Registration of Births and Marriages in Nottingham was relocated to the Council House and the building has now been acquired by Nottingham Trent University. ROYAL NATIONAL ROSE SOCIETY DISPLAY GARDENS. This society was founded in 1876 and is based in St Albans, England. The Society is dedicated to encouraging, improving and extending the science, art and practice of the cultivation and conservation of roses. 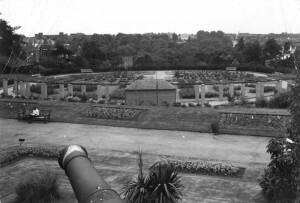 The creation of a display garden was seen as prestigious for the City of Nottingham at this time. One of the founders of the National Rose Society was the Reverend Samuel Dean Reynolds 1819-1904. 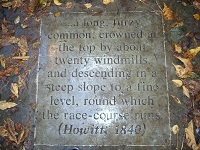 Dean Hole as he was widely known was born in Caunton, Newark, Nottinghamshire and is regarded as the Father of the Rose. He wrote widely on the subject of this plant including, in 1869, Roses: How to grow and show them, a book which had a significant impact on the cultivation and display of roses in the civic and public spaces in the 19th Century. As vicar of the Parish of Caunton, Newark, Dean Hole was regularly called upon to judge rose shows. In his memoirs he recalls being asked to judge a show in Nottingham in 1870 which was being held in a Nottingham Public House. The exhibitors were all mechanics and working men and women on this occasion and the roses were displayed in milk and beer bottles. 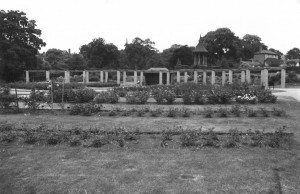 This show appears to be a precursor for the first Annual Exhibition of the Nottingham and Midland Counties Rose Show held in the Arboretum in 1875, with the last show taking place in this location in the 1950s, the St Ann’ (allotments) Rose Show. Another famous rose grower in Nottingham was Harry Wheatcroft born in 1898 in Sneinton at 23 Handel Street of working class parents (he died in 1977) and has been famously portrayed as a flamboyant character with a large handle-bar moustache and his portrait in the National Portrait Gallery depicts his affinity for roses and his political allegiance as a member of the Communist Party.